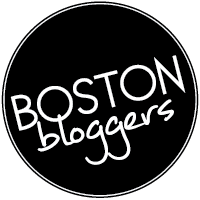 Let’s hope this shift in employment doesn’t affect my blog work. Although, it most likely will because my editor has already noted her lack of volunteer workload. Staying tried and true to my one to two weekly posts, today we’re going to discuss glorious whole grains! I’m not really one to shove my opinions down other people’s throats, which in some ways makes this blog completely ironic. I mean this entire thing is devoted to nothing but my thoughts. I’m finding self-induced egotism suits me quite well. Never the less, whole grains are something I am somewhat passionate about. My mother raised both my brother and myself on whole wheat products. Back in elementary school I cursed her for this. I faced rejection on a daily basis when my classmates refused to trade lunch items with me. Sandwiches on whole wheat bread, whole grain chips or crackers, grapes, and peanuts were all that armed me on the lunchroom battleground. Ahh Danielle Howard, how I coveted your Lunchables. It all paid off though. Today I am thankful for being force-fed whole grain products as a child. There was never a need to shift the way I ate grain-based products. Today, most of us know whole grain products are touted over refined white carbs, but why? Before we continue, that definition sounds like we should be eating wheat right off the stalk. It’s important to note that if the grain has been processed (e.g., cracked, crushed, rolled, extruded, and/or cooked), the food product should deliver approximately the same rich balance of nutrients that are found in the original grain seed. Okay, that sounds way more reasonable. For visual purposes, below is a diagram of an average grain kernel (think wheat). When grains are refined, the bran and germ are removed. The bran is the mother ship of nutrition. This external casing houses dietary fiber, omega fatty acids, protein, vitamins and minerals. The germ is the reproductive part of the plant or the embryo of the seed if you will. It contains vitamins and minerals such as vitamin E, thiamine, zinc, magnesium, and phosphorous. Phytochemicals and antioxidants are disease-fighting components people commonly associate with fruits and vegetables. What you may not know is that both of these are found in whole grains. Many of us are familiar with antioxidants; these little compounds protect us from free radical damage both internally and externally. Incorporating antioxidants into food products has become very popular. Just yesterday I found a dog food that claims to contain antioxidants in the form of pomegranate extract. You know something is popular when animal food companies are jumping on the bandwagon. It’s like those Fancy Feast cat food commercials. I could literally see myself trying one of those things simply because of how appealing their advertisements look. Call me crazy, but who wouldn’t want to try one of those gourmet wet cat foods? Moving on. Phytochemicals are simple chemical compounds in plants that are important to promote healthful reactions in the body but are not classified as nutrients required for life and growth. Regardless, I think they sound fantastic. So much so that I will probably name my first-born after one of them. Commonly referred to phytochemicals include lutein, lycopene, beta glucans, and carotenoids. Potential health benefits of phytochemicals include reduced risk for cardiovascular disease, raising HDL levels, reduced risk of prostate and cervical cancers, and blocking cancer growth. These things appear to be the Wonder Woman of disease prevention. Numerous studies have been done over the years specifically looking at the health benefits of whole grains. The American Journal of Clinical Nutrition, the Current Atherosclerosis Report, the Journal of Nutrition, the Journal of the American Dietetic Association, Nutrition, Metabolism and Cardiovascular Disease, and the International Journal of Food Sciences and Nutrition are just a few publications which have published studies in this area of research. What a substantial amount of medical evidence has shown is this. Whole grains reduce the risk of heart disease, stroke, cancer, diabetes and obesity. Don’t believe me? Just go here. So how can you get your grubby little hands on some sweet whole grains? Quite easily. In fact, you may already be consuming whole grains without even knowing it. As we’ve already learned, whole grains contain the bran, the germ and the endosperm. Examples of whole grains include brown rice, whole wheat flour products (bread, pasta crackers, etc. ), oatmeal, bulgur (cracker wheat), quinoa, and whole corn meal just to name a few. The U.S. Dietary Guidelines recommend adults consume at least half of their grains as whole grains (three to five servings of whole grains per day). So what’s one serving? Your friends over at mypyramid.gov have your back. 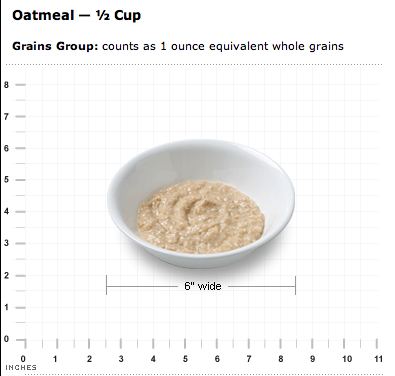 They have put together a picture-by-picture food gallery for grain serving sizes. To the right is an example of one such image. Honestly, I think these example pictures are rather complicated, however they do give you good basic information. Half a cup of cooked brown rice or oatmeal, one slice of whole-wheat bread, five whole wheat crackers, three cups of popcorn, one cup whole wheat cereal flakes are just some examples of what makes up one serving of whole grains. Having said all this, it’s not just bland whole-wheat products that make up this category. Honey Nut Cheerios, Kashi Go Lean Crunch, Chex, Eggo Waffles, and Old del Paso Taco Shells are just a few whole grain products that people don’t tend to conventionally think of. It gets better. The good people over at the Whole Grain Council have a special stamp on products that contain whole grains. They have taken the guesswork out for you! I encourage you to shop for whole grain products this week. They pack a powerful punch of protein, vitamins and minerals that refined carbohydrates cannot match. This is one area of the diet we all can improve upon simply for the health of it. Come back Friday for the Shameless Product Placement of the Month!